Roughly an hour outside of the capital city of Kampala lies a small Ugandan village called Kikaaya. At “Kikaaya College,” (which is actually a high school), 750 kids study a wide range of subjects and trades. Many students at the school face significant hardship – the majority live in poverty and have significant responsibilities for their families outside of the classroom. Others have various types of disabilities, and some have little to no family. Despite these challenges, the kids at Kikaaya are extremely bright, generous, welcoming, and extremely passionate about sports and music. Our work at Kikaaya is a collaboration between various groups of people working toward the same goal. Our partners include but are not limited to the Ugandan National Basketball Team as well as the Nation Foundation, and NGO doing amazing work in Kikaaya. Together, we built the first ever full-sized professional basketball court in the village of Kikaaya, along with a sports complex that allows students and villagers to stay healthy. We also make sure that students have the proper equipment to play safely and with pride. On the music front, there is an inextricable connection between Ugandans and traditional Ugandan music. As such, we’re working with an incredible local music teacher to create traditional drumming and dance classes on a daily basis. The kids at Kikaaya are incredibly talented, and the entire school enjoys watching and cheering on the dancers and drummers who are learning to perform quite challenging rhythms and motions. The Centre Presbytérien d’Amour des Jeunes (CPAJ) in Kigali, Rwanda is a rehabilitation center for orphans and homeless children that was created in the wake of the devastating Rwanda Genocide to help the new population of highly vulnerable children. CPAJ focuses on keeping children healthy, happy, safe, educated and ready for the world. ISMP has partnered with CPAJ to create music classes for the kids. Each morning and afternoon, kids sit with volunteer teachers and learn how to play guitar and piano. As classes have progressed, you can find increasingly more kids using the guitars in their free time, outside of the formal classes. Life is not always easy for kids at CPAJ, but the music classes help allow them to enjoy themselves, be creative, and feel more confident. In the aftermath of the ravaging Rwandan Genocide of the 90s, many children were left without families and without any safe place to live a healthy and safe life. As a result, child rehab centers popped up around Kigali with the goal of providing psychological relief as well as food and shelter to kids while they help find ways for kids to reintegrate back into a family in society. After partnering with CPAJ to provide sports and music opportunities to kids staying there, we partnered up with Enfants De Dieu, our second child rehab partner in Kigali. The kids at EDD are incredibly talented and have a wide array of interests. That’s why rather than work with EDD to make one sport or one type of musical education possible, we’re working with them to give several different opportunities that speak to the passions of different children. On the sports front, we’re helping them get proper fields and equipment for volleyball, soccer and acrobatics. On the music side, the kids at EDD have a real passion for different kinds of dance. That’s why we work to provide opportunities and lessons in both breakdancing as well as Intore, the traditional warrior ballet that is popular amongst Rwandans of all ages. In addition to creating sports and music programming at EDD, we’re creating opportunities for the kids at EDD and CPAJ, the two shelters we work with in Rwanda, to come together for joint days of sports, dance, and fun. Many of the children know each other from their days living on the streets, and these events are an incredibly special occasion for everyone. ISMP's newest partnership is a sports and music program at Covenant House in New York City. Covenant House started over 40 years ago when a few young teens had nowhere to go in the midst of a blizzard. Today, Covenant serves as a shelter for homeless youth across the city and in other locations across the country. Each week, ISMP volunteers provide music lessons and basketball clinics that are open to any of the roughly 250 homeless teenagers that sleep at Covenant on any given night. Music lessons are composed two sections. The first half of the class is for guitar instruction. Students taking guitar lessons range from complete beginners to those with advanced proficiency. Our method of teaching is to get students playing as quickly as possible to make it rewarding as quickly as possible – by the end of Day 1, most students are playing a song already. The second half of class is the Jam Sesh. Covenant houses a lot of incredibly talented kids, as well as a lot of incredibly passionate ones. Our jam sessions take on whatever form the students there want it to – sometimes someone will lead the rest of the group in a jam of a song they wrote. Other times, someone will play a popular song on piano, and next thing you know, theres a ten person jam session filled with guitar, piano, drums, rapping, dancing and singing. Basketball clinics take place in the Covenant gym. We play shooting games, run drills, and then we do what everyone wants to do most: play games. A three on three round robin tournament typically takes up a large portion of the day. Our volunteers man the scoreboard, facilitate the games, and work to make sure that everyone is having fun. As in all of our programs, we aim to make sure every kid that shows up gets something out of it. For some kids, that’s learning to play two chords; for others it’s making a lay-up in a basketball game; for others, it’s leading a room full of people in a jam of a song that you wrote. In working with dynamic communities, we take an adaptive and flexible approach that allows the children that show up on any given day to influence the lesson for that day. Conflicts around the world, most notably the Syrian Civil War, have left many people with no choice but to flee on a boat and hope they arrive somewhere safely. Many of these people arrived at Ritsona Camp in Greece. But in doing so, family members were killed, homes were destroyed, and futures became uncertain. 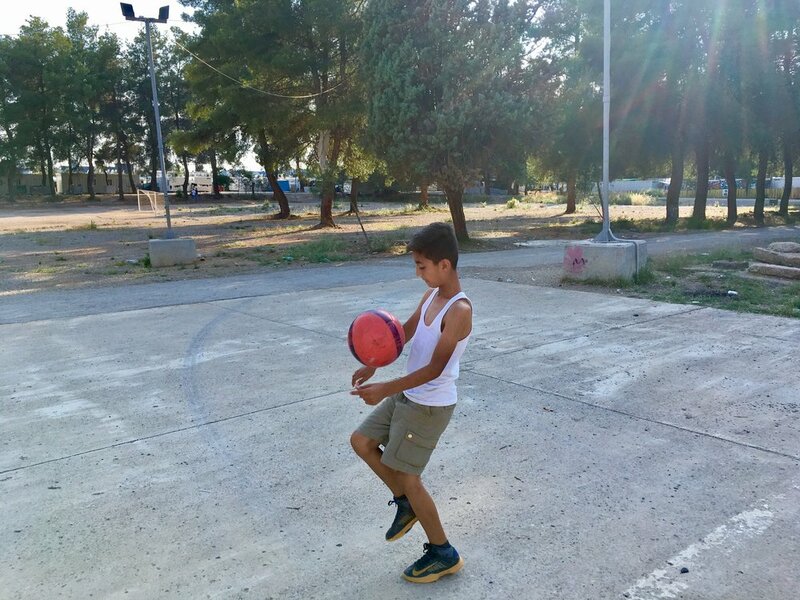 Other organizations provide basic needs such as food, water and medicine, but refugees at Ritsona lack expressive outlets and opportunities to get away from the despair. That’s why we keep our focus on the mental health of refugees. Since we first launched at Ritsona, we've built a soccer field, organized several different soccer teams, outfitted hundreds of children and adults with sneakers and jerseys, organized tournaments and provided dozens of soccer balls to the community. We've also supported music lessons open to any of the roughly 800 people that live at Ritsona. In order to make this possible, we supplied guitars, keyboards, drums and teachers. We also partnered with other NGOs to make sure that music lessons are able to reach a wide breadth of refugees at Ritsona including working with the Teen Center. Being part of a music class or soccer team allows Ritsona residents to enjoy themselves and to focus their attention, energy and emotions on something constructive and fulfilling. In this way, we provide necessary psychological relief to people who are not given much emotional support despite dealing with significant trauma the significant trauma they face every day. Helping refugees is about more than just providing enough food and medicine to survive. It also involves helping people find ways to continue enjoying life. This is a major challenge when you're trying to help a child who has lost his/her family and home, as so many of these children have. 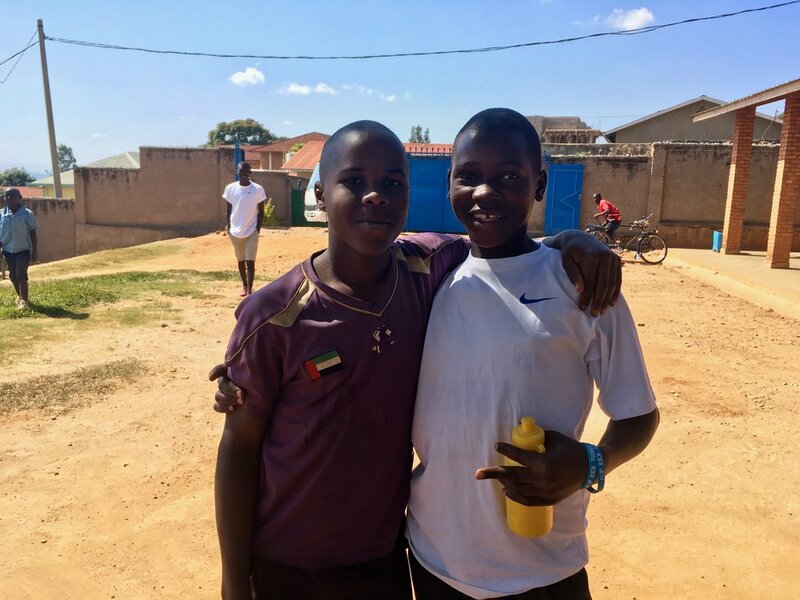 Soccer games and music lessons give people something to look forward to, an outlet to turn to as a means of getting away from the immense pain that people are feeling. Soccer provides some semblance of normalcy in a world that can feel unhinged. Being part of a soccer team can restore pride and dignity, can build hope and confidence, and can allow people a few moments of peace. Things change quickly at a refugee camp. We’re working on building stable partnerships with other NGOs, volunteers, refugees, and community members to adapt to the quickly changing environment and to make sure that the refugees are not forgotten. In 2016, we began working with communities of refugees that fled to Greece from war-torn towns and cities around the world. Many came from Syria and Iraq, though others came from places such as Somalia, Sudan and Iran. After successful programs at Ritsona Refugee Camp, we connected with Musikarama, a rock band of refugees from around the world who uplift refugees in Greece through music. Though the different members of Musikarama hail from different places around the world, they all have two things in common: they left their home behind, and they love music. Now we’re working with Musikarama to expand the use of music as a tool for joy and peace. Musikarama carries out this task in many ways from putting on concerts at different refugee camps to providing guitar lessons to little refugee children. The first ISMP project was inspired by a group of kids living about 6 degrees above the equator and roughly halfway between Hawaii and the Philippines on a small island called Pohnpei, one of the four states of the Federated States of Micronesia. On Pohnpei, there is a rural municipality called Madolenihmw, and at Madolenihmw High School, the students LOVE basketball. The difficulty is that the MHS students need proper equipment in order to maintain their team: they need new basketballs to practice with, basketball sneakers to avoid foot injuries, and jerseys and tournament/transportation fees so that they can compete against other teams in Micronesia. How much do these kids love basketball? So much that while we we were doing our initial fundraising (before sneakers and jerseys arrived), kids would opt out of their bus ride home just so that they could come to practice. That's not a small sacrifice when you practice barefoot on concrete for two hours and then need to walk back to your village 5-10 miles away afterwards. The kids didn't care - they just wanted to play. From 2014-2016, ISMP partnered with Madolenihmw High School to provide MHS with the equipment needed to play regularly and to compete against other students in Micronesia. After coaching for a year, we passed on the reins to local teachers. The goal is to get these passionate and basketball-loving students to play basketball safely and with pride. In a world that can be difficult to cope with at times, becoming part of a basketball team can have a transformative impact for a child. No one should be turned away from the game of basketball because they don't have a pair of sneakers.